With a wide smile and a nice open face Selim entered our national ashram in Uvaly in Czech Republic one early September evening. It happened exactly on the day of our national council meeting… He had just picked up his son from the Borotin kindergarden. VH: As I asked each yogi, I would also like to ask you … how did you come to Sahaja yoga? SE: That is a long story but in short I met Sahaja yoga in January 1991 in a body building sports hall after a long sequence of events in my life. When I look back I realize how lucky and blessed I was to have met Sahaja yoga at that time as it was a very very rare thing to come in contact with Sahaja yoga then in Turkey. And also even more blessed to understand that Mother has not left me the choice to be in Sahaj or not and She took over and gradually I was into it. And Still that is a prayer I keep “Mother please chose for me, decide for me, take the flow of my life into Your hands“. We all know She does it thousand times better than we could. Miracles, such flow and organization of events, just a feeling of gratitude comes over as I think of those times. God is Great, Mother is Great. VH: What were your music beginnings? In booklet of your CD I have read that you used to be a rock musician? What did you play on and in which bands? SE: I started music quite late I was 14. My parents insisted that I learn classical quitar. After a couple of years I realized to read notes and to play was very difficult for me – and still today I have a big appreciation for my brothers and sisters whom I see to play classical music and can read notes just like a book. Any way after a couple of years I got an electric guitar and started playing rock and even heavy metal. Then in the university I started shifting towards Jazz and I played jazz guitar and that is the times when I started Sahaja yoga. I had several jazz compositions. So after Sahaj I heard Hindustani Classical Music and that really got me, it penetrated into me. I felt its great expressions and impressions and improvisations. I loved it in short. So naturally I tried to play it. First I learned to play the tabla, still I love to play it with my limitted capacities. But the feeling of Rhytym came to me so easily and spontaneously. Then I wanted to get some melodies out so I got a Turkish Folk Instrument called “cumbush“ and changed the tuning and started to play ragas on it. VH: In ashram in Uvaly you were telling a story about the disscusion between Shri Mataji and you where she told you that you should learn to play on sarod. Could you please let our readers to know the story? SE: Then first time I played in July 95 for Shri Mataji in Istanbul with the Cumbush. Her liking of it made me more enthusiastic for playing. Then again in 98 Easter and 99 Easter Pujas in Istanbul I played in Her Presence and She was pleased and She praised me and my playing and added that I should go to the academy and learn the sarod every time I played. This was not a discussion I must say. It was Her suggestion or I can say Her Divine Order which is not like an order at all but through that immense Love She just says it and that comes and settles in your heart and you can not do anything but to obey that subtle commandment. Only Goddess I guess can order in this sublime way by taking your heart into Her Hands. But for me it took a bit long, as She told me in all these years 3 times to go to the Academy and finally by my wife‘s support I got the courage to leave work for 3 months and went to Nagpur in the beginning of year 2000 to learn the sarod. VH: Your CD contains two ragas. One for middle heart and other for back agnya. Could you please tell us a little bit about the meaning and effect of these ragas? 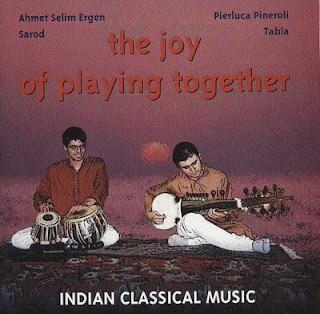 SE: This cd we recorded in Sept 2001 with my dear brother Pierluca. I dont remember how we chose these ragas. But Bageshwari and Durga are wonderful ragas, which I love to play always. And everytime I play I try to play them better and get more deeper into them. I read somewhere ragas are like deities and they have to be approached with utmost devotion and reverence by any musician if he needs to unfold the greatness of the raga. I believe it is true. But for the effect of the recorded ragas, I have to say that if any good comes out of them, it is only Through Mother’s Blessing as we recorded this cd at such an early stage, only 1,5 years of sarod practise. VH: What sarod means to you? How did you learn to play on it? SE: So sarod is the order of my God to me. It is Her Blessing, Her desire for me. Thus is very very precious to me. Every time I sit to play, I think of Her and pray that I can fulfill that order and touch the depths of my spiritual existence with whatever capacity I have. Whenever I play for my brothers and sisters in Sahaj, I pray that we may altogether rise up in our devotion and whenever play for non Sahajis I pray that this music should invoke in them the desire for God, the Love for God so that they long for Her and search for Her. I was told before that sarod is very difficult even for some it is the most difficult instrument. It is true. I had a difficult period in the first months when I was a bit worried as to whether I was doing the right thing trying to learn the sarod at such a later age. But Mother’s words kept me on the path. I learned from Shankar Bhattacharya in Nagpur Academy and to this day I feel lucky to have become his student. He is a very good sarod player and also a wonderful person and also has lots of Love and Respect for Shri Mataji. He has been blessed by Mother many times as he played for Her may times. His teaching style is not at all theoretical. Just we sit together and he starts tuning to a raga which he tells me and I also tune to that. Then he starts playing and I try to copy his phrases, sentences, strokes. Anything I can hear I try to copy. He does not stop much to wait for my copying but teaches me the right thing just when I need. We have that brotherly connection that we understand each other. He is also a blessing of Mother for me. Then when I am alone – which is mostly the case - I learn on my own, in that Mother is my guru. She teaches me through unconcious and things which are not known to me consciously – the feelings, touches, expressions,etc..- starts to be open to me. I try to keep an hour of practise every day at least. My job unfortunately does not allow me to devote more time to it. VH: Sarod means connection with agnya chakra. How do you feel this connection? SE: My guruji , Shankar Bhattacharya once told me that Shri Mataji wrote to him on a paper that sarod is an instrument of the heart. So the beautiful combination of the heart and agnya. Isnt it when we have the heart open, we can forgive much easier and just leave all things aside and rise in Love. But of course the difficulty of the sarod reminds me of the agnya chakra. And I heard Mother also said once “this is a blind instrument“. It is difficult to get the right places of the notes on the sarod as there are no frets. So seeing does not help, one has to hear every note and this requires a very alert attention which is just relaxed. Similar to the state of thoughtless awareness. As we try to shift neither to the left nor to the right, the same we try to do in sarod, not to the left or right but just to get the right, perfect note. VH: In 2002 I saw you in Cabella performing a concert in front of Shri Mataji. I think it was your first performing in front of Shri Mataji. How did you feel? SE: That was not the first performance before our Mother. I will not go into detail but I was priviledged, honored, blessed whatever you can name it, to play for Shri Mataji quite many times. The first time I played Sarod for Shri Mataji was in Easter Puja 2000. Just 4 months after I started to learn. Every performance before Her is like a dream, such unique experience. They are golden moments of our lives. But the one in 2002 was also very special. That was in Guru puja and Mother had sent a mesage to me whether I will be coming to the puja and if I do She would like me to play the sarod. So after I got the message until I played I was like in heaven and full of devoted feelings and gratitude in my heart that God would be so merciful and kind to request me to play for Her. When I would die to play for Her She would in Her Gentle way ask me whether I would come and play in Her Presence. 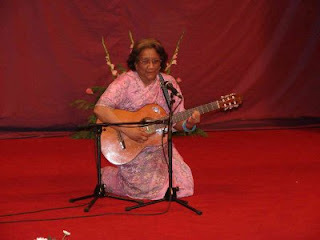 To play in front of Shri Mataji actually was not always easy for me. Sometimes I would have a little tension of whether I will be able to make full justice to the chance granted on me. To get the perfect moods out of the raga and do a proper rendering is not easy but when I start to play I really dont think. But there are moments like when everything clicks together, then I am also listenning to myself, not only playing. The force and rhytym, melody all flows effortlessly and Sahaja then I know I am in Her Hands and She is playing. Those moments were really great and are very unique. Full of Love.